﻿ Best and Big kung fu family of Kunyu mountain academy. I would like to study kung fu in a traditional kung fu school in China since i was a kid. It took many years to do it. And I’m really glad that my dream became real. My greatest gain was to learn from passionate masters and motivated students, and having a feeling of being in a big kung fu family. Everybody influenced and motivated me. It was an incredible energy. The experience in the academy helped me to train my spirit. Mind and body again, living a pacific life in Kunyu mountains. The translators try to help every time they can. The masters haven great experience; they are very patient and push us to the limit, so we can achieve another level in our training. I’m grateful to have a chance to learn from them. Thanks to everyone and special thanks to Sifu Gao. I send here this little present with a feedback together. 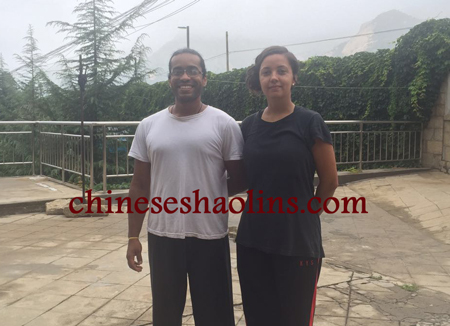 Keith couple training Shaolin kung fu in Kunyu mountain. I came to this school because a friend of me went to this school a year ago and she told me about her amazing time she had here and the experience. I always wanted to train in a kung fu school in China so I decided that this was time to go! I am glad I did it and will never forget it. I like the power training on Wednesday and the big mountain every once in the 2 months. I didn’t follow the optional classes because I wanted to train. It’s nice that you can choose what you wanted to learn in private class. And I really loved the privet classes with shifu Sun (to learn snake form). I am really glad that shifu Sun is my shifu. I learned a lot of him and I like the way how he coached us. I also liked it that the groups are mixed with men and women. Shifu Sun and other students. I asked many students to help me with different forms and everybody was really kind and helpfulness. I was really happy with my master, he was good! The translators were nice. I really loved the environment (the mountains and the lakes! ), it’s beautiful.Thanks for every this 2 months, I enjoyed the time! Family groups (brother and sister ) trained here for two month in Kunyu Mountain academy.